Farming Foible, or an Agrarian Adventure? : A french themed bridal shower, because what else does a lady farmer do in her spare time? 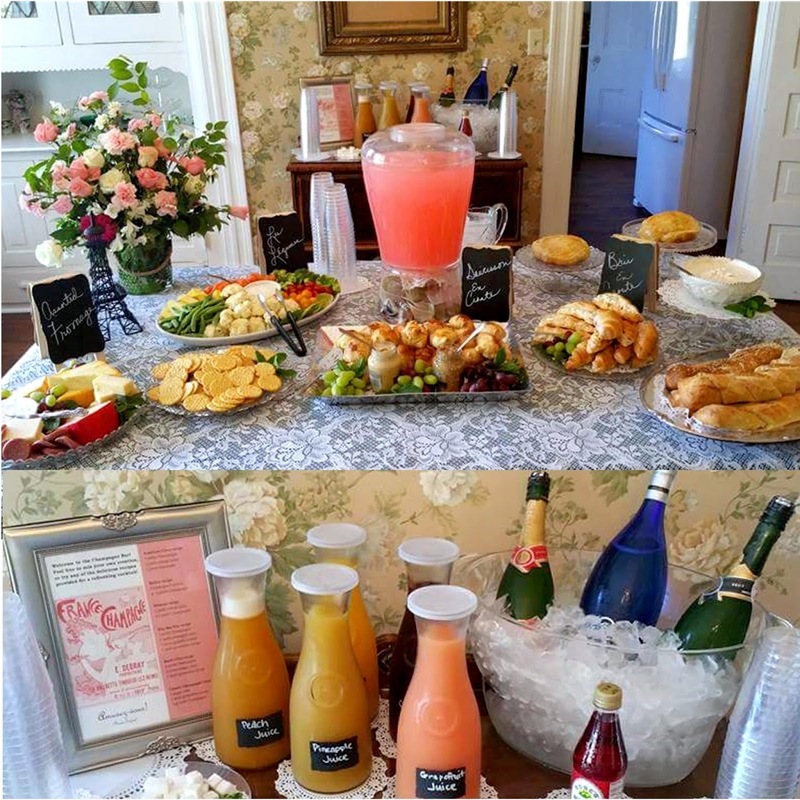 A french themed bridal shower, because what else does a lady farmer do in her spare time? In addition to being a writer, B&B owner, and farmer; I have always had this really stupid dream of being a professional party planner. While I mow acres upon acres of lawn I daydream about hosting elaborate Better Homes and Gardens worthy parties. That’s why I took on my cousin’s bridal shower. Well, that and I was the only geographically local bridesmaid. My family has a habit of just deciding that someone has a hobby, and then gifting them nearly nothing else until a person gets a personality out of desperation and a lack of places to keep storing all the themed treasures. In my case – wine themed gifts EVERYWHERE. My house looks like I own a wine bar. Which I’m okay with, because hey, who wouldn’t love being surrounded by wine? My cousin? Well, she had the unfortunate pleasure of going to Paris once in undergrad. So, yeah, her shower theme? Paris, or “French garden” because she had lots of décor we could borrow and I’m classy. Or because in addition to wine my other gift theme is garden so… I don’t want to brag here, but I had some stuff. A platter already owned is a platter saved, people. Showers aren’t cheap. Fortunately the shower was the Saturday before Mother’s day, and my mom worked as a florist before becoming the president of a conveyor company, so I was able to beg my way into free flower arranging of grocery store bouquets and wild flowers. Okay, not really wild, more like along the driveway and out of my yard flowers. While she worked on the flowers, I had my aunt and fellow bridesmaid cousin helping set up, and I cooked. I had Googled a bunch of French recipes for the party: sauscission en croute, brie en croute, croquembouche, and something that turned out to be glorified French onion dip… damn language barrier. There is nothing quite like being up at five in the morning attempting to teach yourself how to make caramel to assemble a tower of cream puffs. Caramel is hard. It is also hot. Someone in a forum referred to it as baking napalm, and that is 100% accurate. I had blisters all over my fingertips before it was all said and done, and the damn croquembouche fell over. Twice. I finally stacked strawberries inside it and Saran wrapped it together then stuffed it in the freezer to maintain its shape. It still tasted great, and while not as pretty as it had been initially it looked nice on the buffet. Lauren’s saucisson en croute: purchase 2 packages of beef kielbasa and a box of frozen puff pastry. Read the recipe and then leave it at home in your rush to move everything to the venue. Cut the sausage into bite sized pieces. Using thawed pastry wrap the sausage pieces and seal them up into small pockets of delight. Realize that you need and egg wash. Nearly decide to forgo it, but then think of what people will say when the pastry looks weird. Panic. Send your aunt to the store for eggs. Die a little because you are using store bought egg yolks to glaze your bundles of pastry and you literally have enough eggs at home to take up egging houses as a competitive sport. Bake for approximately 35 minutes, until golden, in a 450 degree oven. Serve warm with mustard, and make sure to stand next to them so you can tell your family to: “Try one! Please?” Resort to saying, “They’re just fancy pigs in a blanket.” Let your inner foodie sob. Lauren’s brie en croute: buy round of brie, apricot jelly, and frozen puff pastry. Thaw pastry sort of like they say on the box, but don’t actually read the box until you have already thawed the pastry. It’s more fun this way. Lay out the puff pastry sheet, set brie round on top of puff pastry, take a double tablespoon full of jelly and schmear it across the brie. Wet your fingertips with water, or stress induced tears for added flavor, and seal the pastry. Brush with egg whites and bake until golden brown in a 400 degree oven. Serve warm with freshly baked baguette or crackers. Fortunately people should try this on their own since they liked the saucisson so much. Thereby validating you as a cook, host, and human being. a killer vegetable tray, crackers, and assorted meats and cheeses. What makes it even better? A champagne cocktail bar! Desserts, gift tables, table decor, and games. What more does a shower need? When you have a shower at the Cohen Memorial home, the answer is nothing. 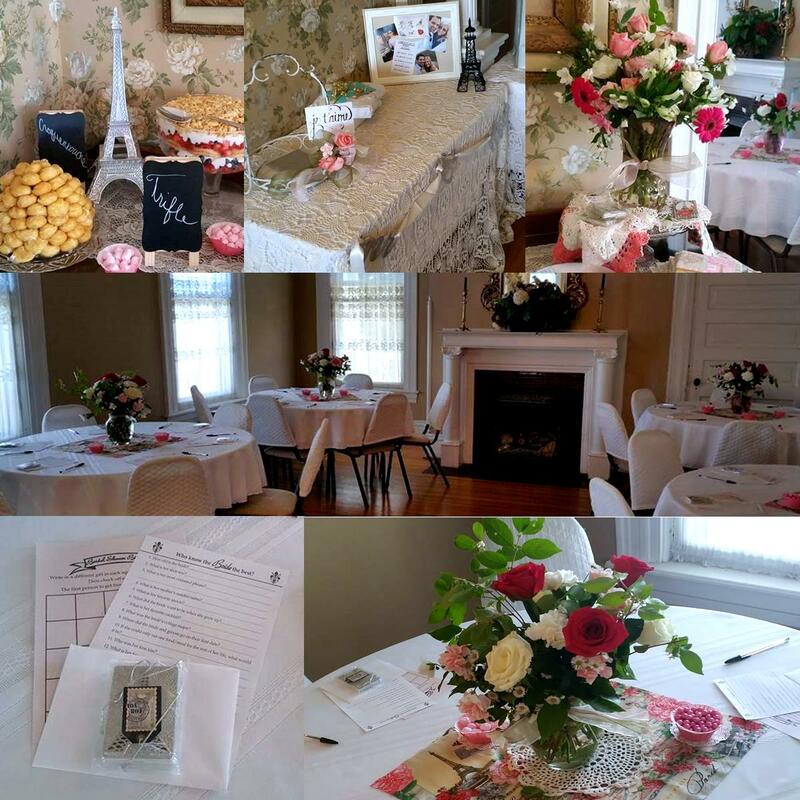 The venue is a gorgeous home overlooking the Missisippi river in Chester, IL. And it only took about four hours after cleanup for me to start thinking, “Yeah, I could do this.” So who knows, maybe my B&B will eventually have an event space? Not a bad thought!